Everything you could want to see in Kathmandu in one day! Our tour guide Jamuna was amazing! She was very informative and helpful. She catered the tour to what we wanted and stood in touch with us throughout our entire trip in Nepal to see if we needed anything. If you book this tour I would highly recommend asking for her! A great tour to all the major UNESCO sites in Kathmandu! My guide was very knowledgable and fun to travel with. I highly recommend this tour for covering a lot in a short period of time. We had an excellent guide who very accurately judged the pace and content we required. She was knowledgeable about the sites and their history, gave us interesting information about life in Nepal, and had excellent English. She was personable and gentle in her manner. We would highly recommend her as a tour guide. Loved this day! Our guide Janina was very knowledgable, patient (we take tons of pictures), and kind. The day is a sensory bonanza because there is so much color, beauty and significance in the places we visited. Highly recommend. It was fine. A bit flexible, especially to eliminate spots that were farther out of the city. Some of the sites were damaged from the 2015 earthquake, which was not the fault of the tour company. 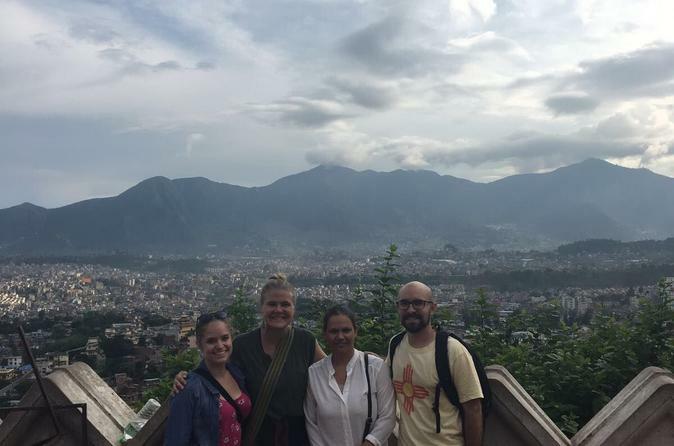 We visited the 5 of the 6 unesco sites in Kathmandu. We were tired and jet-lagged and had one day in the city, so the tour filled the day, and we choose to skip the last site. The tour guide spoke English well enough, but didn't really help us understand the significance of each site. The tour price was already high and we had to pay and additional 10 to 15 per person to enter each site. Plus we had to buy the tour guide lunch very small amount and tip the tour guide and driver. The clutch of the car that we were using went out and we had to walk about 1 km to one site. We probably could have done better by reading a tourist book on Kathmandu and hiring a driver for the day through the hotel. So I feel a bit conflicted giving this tour a 4 star rating. Everything was awesome and the tour guide was the best, super helpful and very kind. We got to see so much in one day, I know that there was no way we would have been able to accomplish so much on our own. The only downside that prevents me from giving it a 5 star rating is that we were caught a little bit off guard by the cost of entry fees. We were a bit on a budget and already paying 110 dollars each for the tour, it was a bit of a ding to our wallets when we realized that we had to pay 10 and 15 for most of the sites one was only 2.50. We spent a total of about 60 on entrance fees. If the total cost for those fees had been clear from the beginning as in before we booked anything, we would have been a bit less shocked and not so thrown off. Anyhow, besides that it was definitely worth it. So only suggestion: list the cost of entrance fees in the description or at least an estimate so that folks can plan accordingly. Thanks so much! SuJan was a great guide. Extremely knowledgeable. Very patience and accommodating. Was a full day packed of all kinds of experiences. Definitely highly recommended. 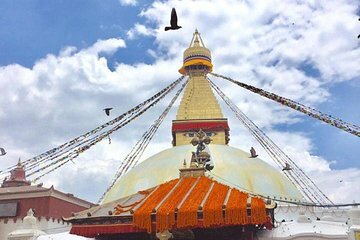 This tour is jammed packed with all of the historic and cultural sights that you would want to see in the Kathmandu area. And no mandatory shopping trips. The 3 Durbar Squares, Bhaktpur, Patan, and Kathmandu, were all well worth seeing, displaying a medieval architecture unlike any I have seen outside Nepal. Patan has a small museum, so you can see what filled the palaces and temples. And these pieces were well worth seeing for their beauty and craftsmanship. Astonishingly enough, at Kumari Chowk , Kathmandu Durbar Sq, the Kumari herself made an appearance at the window. There were only a handful of us present, and we were all awestruck. How does one react in the presence of a living goddess? All of the sights were beautiful and inspirational. For me, the most impressive sight was the Pashupatinath Temple. This is also known as the crematorium. It may sound morbid or gross, but in the presence of people caring for, and venerating their dead, I felt an empathy for the mourners, and a glimpse of something sacred in their lives. I want to commend our driver and guide, who did valiant work battling the local traffic, and were thoughtful and flexible to our wishes. The guide answered many questions for us, not just about the sights, but about the life and culture in Nepal.